This week Luke Maillis used his Headhunter Spearfishing NOMAD polespear to shoot and land the largest Cubera Snapper on record. It is now a pending IUSA spearfishing world record for the polespear/sling division and is 8 pounds larger than the speargun record!! 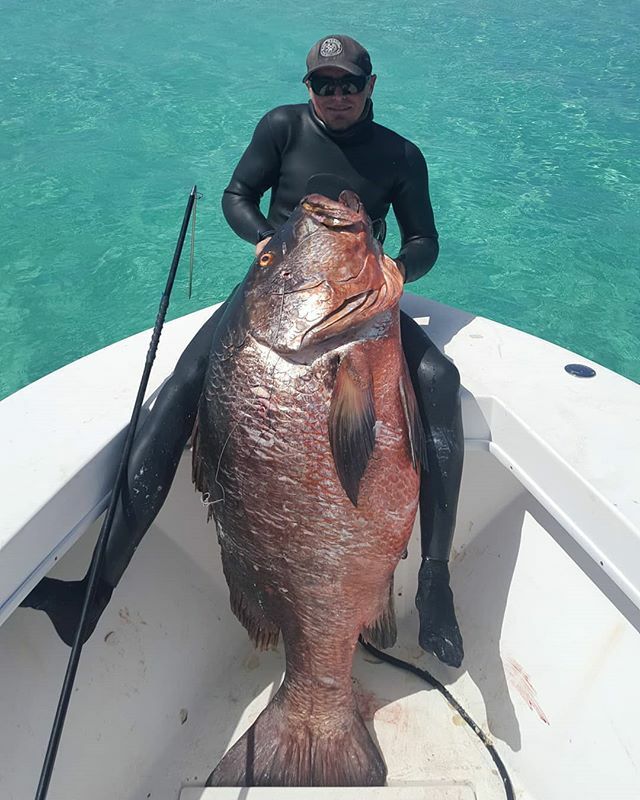 "Today I checked off one of my life goals, shooting This massive 130 lb Cubera Snapper. The most glorious pending World record reef fish in the Atlantic Ocean. Taken down with my Headhunter Nomad pole pear and belt reel. After I shot a Nassau grouper on a reef in 50 ft of water. I saw this Cubera snapper out on the sand. I immediately knew it was a world record fish. I watched him while breathing up, waiting to make my move. I noticed he was swimming towards a ledge, I waited until he swam under the ledge then immediately dived down and had my pole spear cocked and ready. I dropped down under the ledge and saw him face to face. He started to turn and run when I took aim and landed the shot right in the face. He took off running and peeling off line from my belt reel. I chased behind clearing the line from tangling on the reef and watched him run into a deep cave. I went back to the surface for air and started to play him on the belt reel. Letting out slack and pulling him back out of the cave. After 10 to 15 minutes of fighting him he finally swam out of the cave and I began to muscle him up to the surface. I was so scared going to grab him by the gills as he lunged towards me with his mouth open. I finally grabbed him by the gills and called the boat over. Got him in the boat and stood in awe of his majestic size.. the fish of a lifetime. I'm very impressed with the Headhunter Nomad pole spear. It is the most durable spear I've used and I am in awe that it stood up to the giant Cubera after being bashed around in a reef. It's accuracy is on point and you really get your money's worth with this spear. Great job on making a spear that landed my fish of a lifetime. Two years ago we set out to engineer a robust spear that could handle any situation. The result is what we now call the NOMAD. This pole spear is extremely durable, lightening fast and hits like a bull. Made from a proprietary composite tubing and 17-4ph heat treated stainless steel fittings, this pole spear is ridiculously rugged. By combining the 3' front, 3' back and optional 2' and 3' mid sections, the spear can be configured as a 6', 8', 9', or 10' spear with an additional 18" injector rod and tip. Another great perk of this spear is that it breaks down to 38" for travel.